WASHINGTON, March 7. /TASS/. 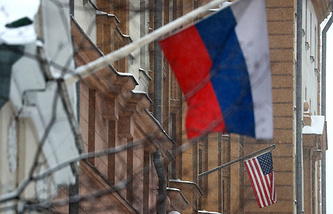 Russian Ambassador to the US Anatoly Antonov and President pro tempore of the United States Senate Orrin Hatch have pointed to the need to normalize relations between the two countries, the Russian embassy said on Twitter. "Ambassador Antonov held a meeting with President pro tempore of the US Senate Orrin Hatch to discuss prospects of Russia-US relations and ways to reestablish inter-parliamentary dialogue between our countries. Both sides agreed on importance of restoring normalcy in our relations," the tweet reads. Hatch, 83, is the longest-serving Republican Senator in US history, as he was first elected back in 1976. He is the chairman of the Senate Finance Committee and at the same time serves as President pro tempore of the US Senate, which is the second-highest-ranking position in the Senate.